You’ve probably gathered that I’m a bit behind in my blogging. Sometimes life is so intense that there’s hardly enough time to live it, what to speak of take photos of it, or write about it. 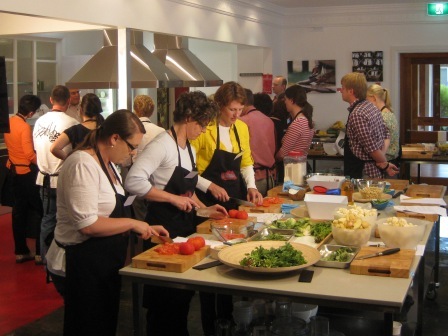 This time last weekend I was in Adelaide, South Australia, doing some filming for ABC Television’s “The Cook and the Chef”, one of Australia’s most well-loved cookery programs. The morning after I flew in to Adelaide, I met up with one of the stars of the show, Simon Bryant, who happens to be Executive Chef of Adelaide’s Hilton Hotel. 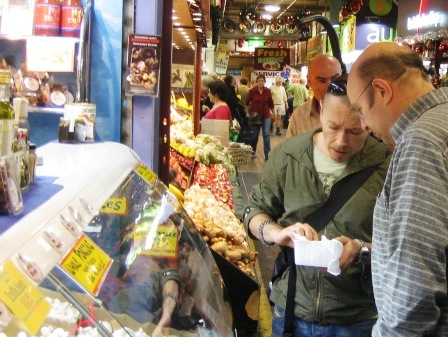 The film crew shot some footage of our time together in the famous and bountiful Central Markets, which happen to be right next door to the Hilton. The ABC and Simon kindly arranged a suite in the hotel for me to rest my weary bones that night. Much appreciated. Before I retired, I chatted downstairs in the restaurant to Sous Chef, Dennis Leslie, who confided in me his love for Hare Krishna food, and especially the semolina halava he was addicted to in his earlier cheffing days. Also, he told me that a very dog-eared copy of one of my cookbooks lives in the restaurant kitchen. Simon and I found a lot to talk about. That’s the cameraman and sound technician behind us. Mark (the producer and mastermind behind the weekend) took these photos. 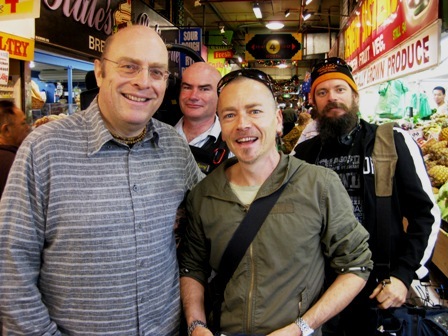 That evening we filmed again, (no pictures, sorry), this time at Adelaide’s Hare Krishna Temple in Kilburn. Over groaning plates of delicious vegetarian fare, Simon professed his affection for prasadam (sanctified Hare Krishna food) and recalled his days in Melbourne when he was a regular at Gopal’s restaurant. 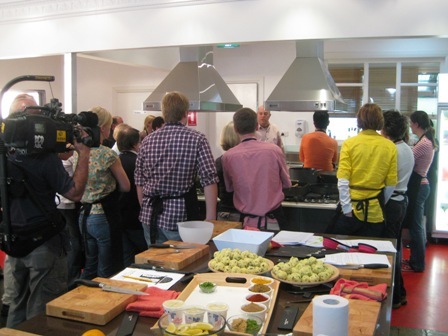 Next morning the film crew were at it again, recording footage from my Saturday morning class at The Sticky Rice Cookery School in the beautiful Adelaide Hills. This ingenious mechanism allows hand-held camera work without back injury. Those cameras sure are heavy. Sticky Rice Cookery School is brand spanking new, and is a dream to cook in – surely one of the best kitchens I’ve had the pleasure to use. On my cue, the cameras (two were used so we did not have to re-record close-ups afterwards) zoomed in on photogenic sections of the morning, like the eggplant pickles, cheese making, to name but a few. 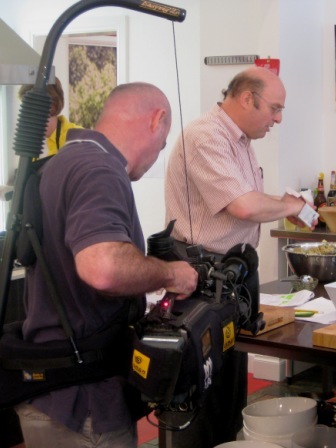 In fact, many, many hours of footage was taken, all to create the finished Crème de la Crème – 3 minutes of primetime TV. That’s the magic of editing! Ah yes, the food. I hardly had time to take my camera out my pocket, what to speak of turning it on. 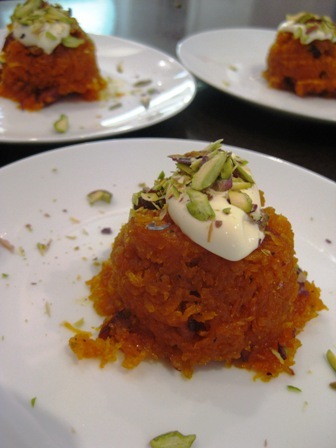 But here’s something delightful – my one and only photo – Cardamom-scented Carrot Halava, the perfect finale for one hell of a weekend. And just a reminder: the show goes to air on ABC National Television on Wednesday, 4 March, 2009 at 6.30pm.